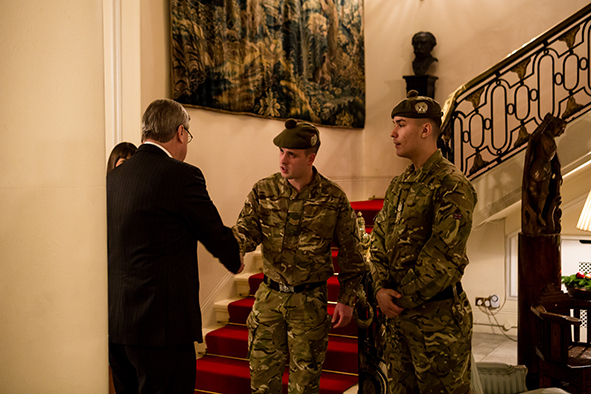 The Belgian Ambassador and his wife kindly hosted a wonderful event for Never Such Innocence, on Thursday 4th December 2014, as part of the Belgian Embassy’s ongoing First World War commemorations. The event was held at the Ambassador’s beautiful residence on Belgrave Square and the evening began with a champagne reception and then guests were invited upstairs for a reading of First World War poetry, letters and songs by the illustrious John Julius Norwich, Alan Cox, Mark Field and Charlotte Newton-John. After the reading, a number of guests joined the Ambassador for a delicious supper in his dining room.